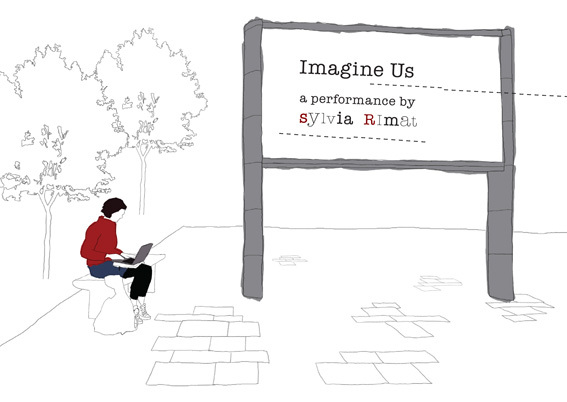 This site-specific project is a variation of Sylvia Rimat's studio performance Imagine Me To Be There. The performance explores possibilities of interaction with the wider public by working with a Big Screen in public space. The words appear live on a large screen. 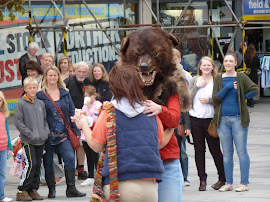 The woman wears a brown fluffy full body bear costume and bright red high heels a bright red top and blue jeans. A playful scenario starts to evolve, situated somewhere between the real and the imagined. By addressing passers-by via text on a Big Screen, Imagine Us aims to heighten our awareness of the physical and thought spaces we pass through. Whilst exploring ideas of presence and mediation, the live encounter is also concerned with bringing public space alive. Imagine Us was premiered in Sep 2011 as part of Plymouth Art Fringe accompanying British Art Show 7 and incorporated the BBC Big Screen in Plymouth City Centre. The show is available for touring, please contact Sylvia Rimat for more details. 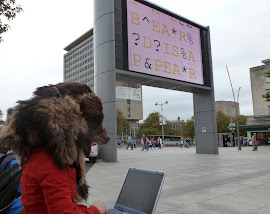 Supported by Arts Council England, Residence, The Basement and BBC Big Screen Plymouth.